Chris joined the club as a V35 Masters athlete. 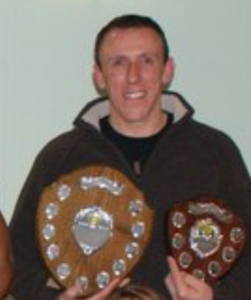 Coached by Bruce Holden, Chris achieved a very good standard Shot Put and Discus throw, which ensured he scored very useful points for the club. Chris was also a great team player and was prepared to throw the hammer for points, he even ran a 2000m Steeplechase, creating a V40 Club Record, to go along with his Shot and Discus Records, in doing so!